The Naxi (also known as the Na-khi, pronounced [naɕi]) are a non-Chinese minority people inhabiting mainly the province of Yunnan (south-western China), as well as the neighbouring regions of Sichuan and Tibet, and most probably also in Burma/Myanmar. The Naxi language belongs to the Sino-Tibetan language family and is divided into several dialects. With a number of speaker reaching 309 thousand (Ethnologue 2009) – including ca. 100 thousand monolinguals – Naxi is not considered as particularly endangered. It is, however, the script used by the Naxi that is in need of documentation and linguists’ attention. In the past, the script was used mainly by the Dongba priests, to write sacred texts of the pre-Buddhist religion of Tibet, known as Bön. 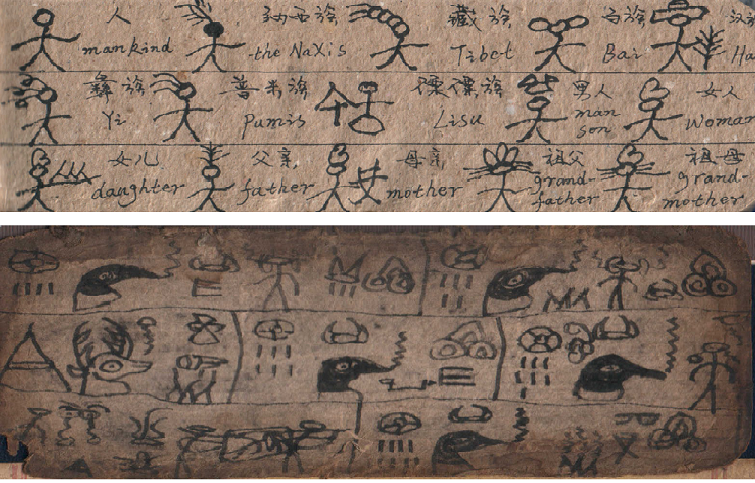 The Naxi Donga script consists predominantly of pictograms, symbols (ideograms) and syllabic signs, being most probably (one of) the last pictographic writing systems in the world. Although at present the script is hardly and rarely used for sacral (i.e. original) purposes (very few Dongba priests stay alive), its popularity among the Naxi community is growing, and the script is becoming more and more visible as used also for everyday purposes, e.g. in tourist and commercial services. Read more about writing systems in the Book of Knowledge (Chapter 5).